Read on to be informed about some really nice things to see and do in Berlin!! 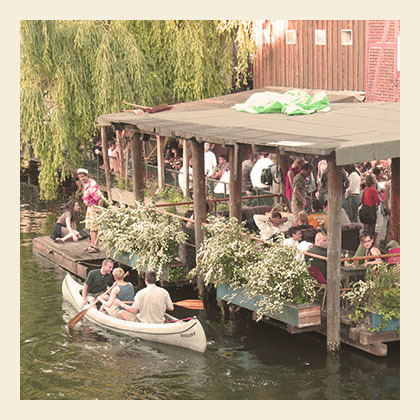 This is how you can spend your Saturday like all the locals living in Prenzlauer Berg. Strawling over the market, buying some things to eat, drinking some coffee or even champagne. At this market, everything is possible! You can even buy clothes and jewelry here, also there are often musicians standing at the ends of the market, playing their songs!! Always a great atmosphere here!! 4. The new synagoge @ Rykestrasse. It is Germanys biggest synagoge! beautiful synagogue that retains much of the original interior. was not struck by war-time bombing. this documentation centre, completely free of charge, is located at the Bernauer Strasse. It is really not far from your hostel in Prenzlauer Berg, it is approximately a 10 minute walk. (small piece maintained) and the death stripe. Learn more about Berlins History by paying a visit to this informative little museum. This huge complex of night-time hangouts originally housed Berlins Schultheiss brewery for more than 150 years. By night the Culture Brewery turns into a popular meeting point for determined drinkers, eager to explore the buildings wealth of bars, clubs, cafes and restaurants, or just hang out in the huge courtyard. the table tennis bar in berlin. don´t think it is a sportbar ´cause it isn´t. A lot of youngsters meet here to get together! There is nothing more fun than playing table tennis with over 20 people at once! Beside that there are dj´s playing great electronic music! It is a great hangout! surrounded by small cafes and restaurants. Enjoy visiting Berlin, enjoy our TOP 10!! If you are looking for a clean and cozy hostel in Berlin, come stay with us :)!